Director – Joe Johnston, Screenplay – David Self & Andrew Kevin Walker, Based on the Film The Wolf Man Written by Curt Siodmak, Producers – Sean Daniel, Benicio Del Toro, Scott Stuber & Rick Yorn, Photography – Shelly Johnson, Music – Danny Elfman, Visual Effects Supervisor – Steve Begg, Visual Effects – Double Negative (Supervisor – Mark Michaels), The Moving Picture Company (Supervisors – Gary Brozenich & Adam Valdez), Peerless Camera Company (Supervisor – John Paul Docherty) & Rhythm & Hues Studios (Supervisor – Derek Spears), Special Effects Supervisor – Paul Corbould, Creature Effects Supervisor – Dave Elsey, Makeup Effects – Rick Baker, Production Design – Rick Heinrichs. Production Company – Universal/Relativity Media/Stuber Pictures. Around the turn of the 20th Century. Lawrence Talbot, a successful stage actor who was born in Britain but raised in America, receives a letter from his brother Ben’s fiancee Gwen Conliffe asking his help because Ben has gone missing. Lawrence returns home to Talbot Hall in the village of Blackmoor where he has not visited since he was a boy, only to learn that Ben has been found dead. Shocked at the state of the corpse, Lawrence determines to find the cause of Ben’s death. He investigates the Gypsy camp where Ben had dealings, just as a ferocious beast attacks. Lawrence tries to shoot the beast but is gored in the process. He makes a remarkable recovery from near-fatal wounds. However, as the full moon comes, Lawrence turns into a werewolf. Running free in beast form, he savagely kills all that he comes across. As the villagers seek to destroy Lawrence, his father instead places him in an asylum. The Wolf Man (1941) starring Lon Chaney Jr is one of the classic Famous Monsters. The film was a popular hit for Universal and the last of the legendary monsters they would create, along with Dracula, the Frankenstein Monster, The Invisible Man and the Mummy. The Wolf Man is most notable not for being a great film but for its influence over the werewolf genre. Only the second werewolf film ever made, it set down several crucial elements of the werewolf myth, in particular the werewolf’s aversion to silver, while the poem “Even a man who is pure in heart/And says his prayers by night/May become a wolf when the wolfbane blooms/And the autumn moon is bright” invented by the film has been quoted by more than one book of mythology as an actual piece of folklore. Surprisingly, The Wolf Man has never been remade up until now. Universal did sequelise the original with Frankenstein Meets the Wolf Man (1943), while Lon Chaney Jr’s Larry Talbot continued to make appearances in other Universal monster bashes throughout the 1940s, including House of Frankenstein (1944), House of Dracula (1945) and Abbott and Costello Meet Frankenstein (1948). The Wolfman remake is mounted by Joe Johnston, a former Industrial Light and Magic visual effects art director/production designer who became a director with Disney’s charming miniature adventure Honey, I Shrunk the Kids (1989). Since then, Joe Johnston has maintained a modest directorial career, specialising in films almost always with a special effects focus with the likes of Rocketeer (1991), The Pagemaster (1994), Jumanji (1995), October Sky (1998), Jurassic Park III (2001), Hidalgo (2004) and the subsequent Captain America: The First Avenger (2011) and The Nutcracker and the Four Realms (2018). The script for The Wolfman comes from Andrew Kevin Walker, best known for his amazing screenplay for David Fincher’s Se7en (1995). Walker has written various other scripts, including Brainscan (1994), Hideaway (1995), 8MM (1999) and Sleepy Hollow (1999), although the great disappointment has been that Walker has failed to produce anything else that demonstrates the same calibre of writing as Se7en. Co-writing duties are shared with the relatively unknown David Self whose work vies between one appalling remake – The Haunting (1999) – and an excellent graphic novel adaptation – Road to Perdition (2002). Andrew Kevin Walker and David Self largely keep to the basics that were laid down in Curt Siodmak’s original script in 1941. A few aspects have been expanded on and built out – Lawrence now returns home because of his brother; there is the addition of a sequence where he is committed to an asylum and then breaks out as a wolf and runs through the streets of London. There is also the introduction of a police inspector who is amusingly named Francis Abberline after Frederick Abberline, the principal investigator in the Jack the Ripper killings. (In fact, cast with Hugo Weaving, the Abberline we have here far more closely resembles the historical character than the one we had in From Hell (2001) played by Johnny Depp). The most radical change is to have Lawrence’s father (Anthony Hopkins) also be a werewolf too – in fact, the one that was originally terrorising the area – thus giving the story an identifiable villain and having the climax of the show be a throat-tearing match between the two werewolves, which does offer the priceless image of acting legend and British knight Anthony Hopkins undergoing transformation and getting hairy. The one disappointment is that we never get the classic ditty “Even a man who is pure in heart …” said throughout, although it does appear as an opening title card. The other distinctive change the remake conducts is to set the film in the Victorian period, whereas the original was set contemporary to the time that it was made. (The film never specifies the date, although it is said that Inspector Abberline investigated the Jack the Ripper killings “a couple of years ago”, which would make the setting about 1890. We also see in the background of London a completed Tower Bridge, which would mean it would have to be some time after 1894). This allows Joe Johnston and his production team to build out an extravagantly hyper-realised fantasy version of Victoriana as setting for the story. This seems appropriate as the original was set in a fantasy version of Wales that existed solely on a studio backlot, never the real world. The remake does an amazing job filling the screen with rundown estates, rustic villages, gloomy mist-laden woods, wide-open moors and beautifully rendered recreations of the streets and rooftops of London, while existing locations have been touched up, to become a superbly stylised vision of Victorian gaslight England. The original The Wolf Man is not a great film and certainly looks creaky today. The virtue of the remake is to take its basics and build them out with a visual splendour and a full arsenal of modern makeup and CGI effects that feels like the original story is finally being given the airing it deserves. Certainly, Joe Johnston does not reinvent the werewolf film from the ground-up, but he does make a reasonable epic out of it. 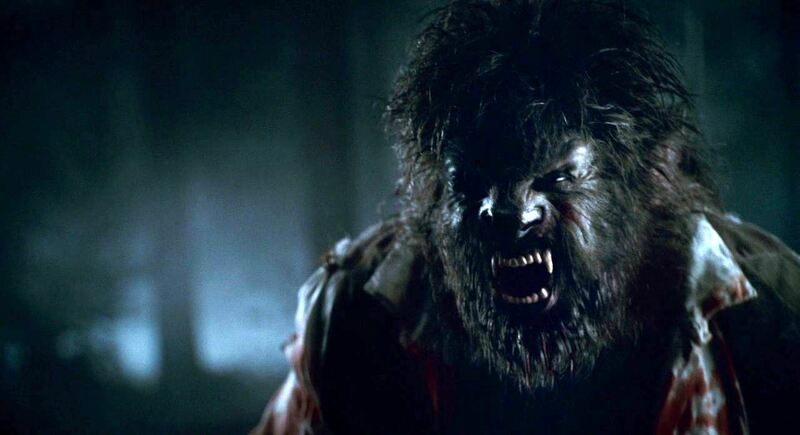 Nor are the transformation scenes breaking any ground that Rick Baker didn’t venture into with his work on An American Werewolf in London (1981), although some of the scenes with Benicio Del Toro transforming in the theatre at the asylum and racing through the streets of London being shot at by police are fabulous. 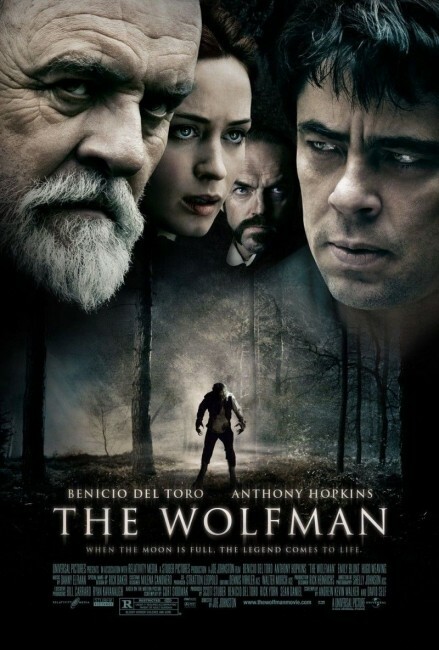 Perhaps the disappointment of the casting is that The Wolfman brings together two Academy Award winning actors, Benicio Del Toro and Anthony Hopkins, but neither of them give truly outstanding performances. Benicio Del Toro seems particularly enamoured of the role – he is apparently a big fan of the original – and has been attached to the project ever since it was announced back in 2006 and passed through various changes of directors, while he also takes a producer’s credit on the finished film. 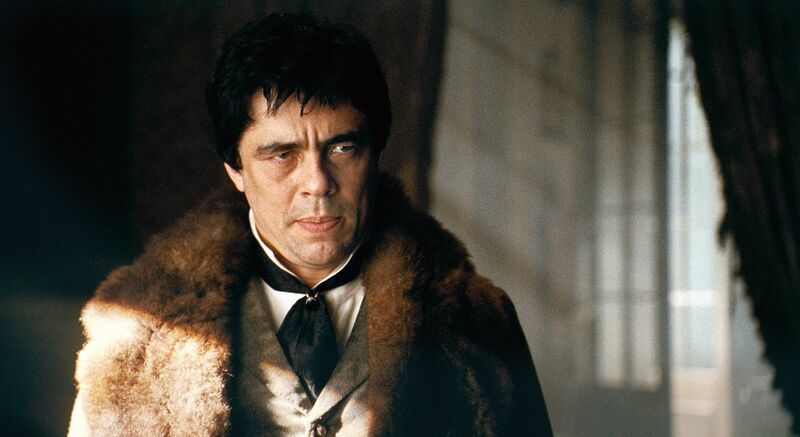 I always had a problem with Benicio Del Toro in the role of the Lawrence Talbot. It seems a stretch of the imagination to see a Puerto Rican cast in a role that is meant to be that of a Welshman. To Del Toro’s credit, he has the same sallow, jowly look that Lon Chaney Jr did in the original, albeit leaner, unhappier and more brooding. On the other hand, one kept waiting for Benicio Del Toro to open up into the part with some major acting muscle and show us the soul of the werewolf – only he doesn’t. (The Jack Nicholson starring Wolf (1994) still remains the definitive soul of the werewolf film). Still, for what it aims for, The Wolfman achieves modestly and effectively. (Nominee for Best Makeup Effects and Best Production Design at this site’s Best of 2010 Awards).